On April 6th and 7th, VC’s, funds, emerging projects, key talent, and executives from traditional finance throughout Asia and around the world will gather for one of the biggest blockchain events in Tokyo, Japan. 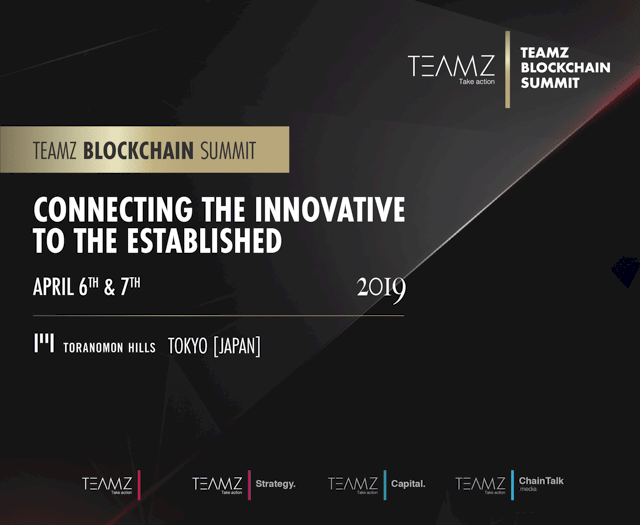 TEAMZ Blockchain Summit is a gathering that brings together the smartest minds and innovators in blockchain. In addition to top talent, the summit will be joined by leading investors, VC’s, exchanges, funds, and the biggest media brands in the industry. It’s expected that around 5000 people will attend the two-day event. Guests come from all over the world and from all demographics. Many are crypto enthusiasts and many others are looking to learn more about the industry through our keynote speakers, panelists, exhibitors, and all our partners. 55 projects, 90 speakers, 100 investors, 100 media platforms, and 100+ industry professionals and talent will attend. Anthony Pompliano, affectionately known as Pomp, invests capital across the crypto ecosystem on behalf of institutional investors. He also runs Off The Chain, a popular podcast and email newsletter aimed at educating professional investors on the crypto industry. Founder and CEO at Qtum foundation, Forbes China’s 30 under 30 2017. Patrick discovered blockchain technology while doing research for his Ph.D. in Communications and Information Systems at China Academy of Sciences since 2012. Patrick is most renowned for his work as the Founder of Qtum, one of the leading Blockchain Platform in Asia. He’s one of the earliest and the most esteemed pioneers of blockchain technology in China, and was also invited as blockchain expert by many media, such as China Global Television Network, CNBC, People’s daily, Nasdaq & TechCrunch. As a former Deputy General Manager of Business in Baidu’s auto driving department, Kiana was a key player in negotiations for the company’s global business development and partnership and have played a major part in negotiations with car manufacturers, upper-class partners and related government bodies. Previously, she has worked with Baidu’s technology team, helping to forge partnership opportunities for the company’s cloud products and big data, promoting it’s breakthrough technology and carrying out related Public Relations and marketing activities with renowned brands to formulate a long-term market strategy in the technology sector. Towards the end of 2017, she was invited to become the co-founder of DigiFinex, using blockchain technology to create an international and diversified digital asset platform. Larry Sanger, best known as Wikipedia’s co-founder, has started or help start many educational and reference websites: Nupedia, Encyclopedia of Earth, WatchKnowLearn, Reading Bear, Infobitt, and most recently Everipedia, which he has joined as Chief Information Officer planning the world’s first blockchain encyclopedia network. A philosophy Ph.D. whose dissertation concerned the theory of knowledge, Sanger has also written and spoken about the philosophy of the Internet and of online communities. Sanger currently lives in Ohio, U.S.A., with his wife and two homeschooled boys. On April 6th, we will have keynote speeches, project showcases and exhibits, and panels with various industry experts around topics such as mainstream use, privacy, decentralization, regulation, STO’s, and investing strategies. Once the main stage closes, we will start our private investment meeting and then have our VIP dinner. On April 7th, we will finish off the rest of our speeches and panel discussions with topics around blockchain innovation, digital wallets, dapps, stablecoins, and changing the world. In the evening we will host our world-renowned red carpet gala where all our partners and VIP members will gather in their finest wardrobes. This is a rare opportunity to meet our exclusive partners face to face and build lasting business relationships and potentially explore new business opportunities.